I go out to feed the chooks in the morning and perform the usual headcount 2,3...Where's number 4? As sense of dread fills me as I head over to the smaller cage and peer in through the window. 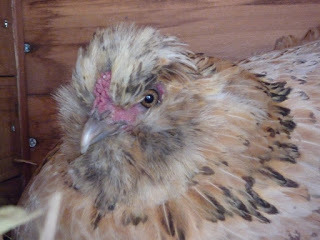 A shrill cry greets my intrusion, followed closely by tut-tutting as if I have broken the cardinal rule of chickens. 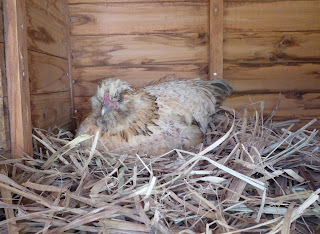 Opening the window to the nesting area, a beady eye glares at me from the back of the cage. This is no chicken - what once was Goldilocks the bantam is now possessed by the daemon Cluck Monster. As a werewolf is changed by the moon, so this chicken is transformed each cycle; its soft calls become the warning that great evil is afoot, downy feathers stand on end as the beast enlarges ready to strike at any vagrant hand that should dare seek her brood. She emerges from her den but twice per day to drink the blood of the sky and dine on the hearts of grain. No strategy works to expel the daemon. Fortunately for all mankind as the passing of the full moon returns the werewolf to human form, so the bantam is returned to her former self after 11 days. 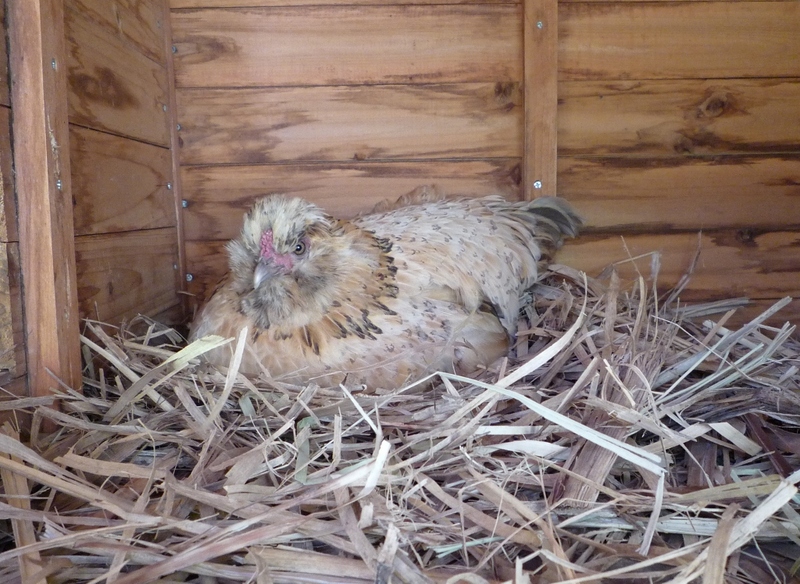 The curse lifts and following a week of recuperation, she plies this unsuspecting food-giver with 12-13 eggs. At the end of this the cycle is complete and her goodness has once again been depleted. The daemon takes hold of her fluffy feet and slightly-larger-than-a-pigeon-sized body once more and the only way to retrieve the precious brood from underneath her is to take a deep breath, summon all reserves of courage and, well, simply pick her up and move her actually.